The term light rail was coined in 1972 by the U.S. Urban Mass Transportation Administration (UMTA; the precursor to the Federal Transit Administration) to describe new streetcar transformations that were taking place in Europe and the United States. In Germany the term Stadtbahn (to be distinguished from S-Bahn, which stands for Stadtschnellbahn) was used to describe the concept, and many in UMTA wanted to adopt the direct translation, which is city rail (the Norwegian term, bybane, means the same). However, UMTA finally adopted the term light rail instead. Light in this context is used in the sense of "intended for light loads and fast movement", rather than referring to physical weight. The infrastructure investment is also usually lighter than would be found for a heavy rail system. 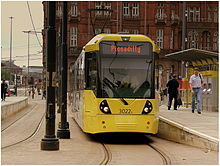 The difference between British English and American English terminology arose in the late 19th century when Americans adopted the term "street railway", rather than "tramway", with the vehicles being called "streetcars" rather than "trams". Some have suggested that the Americans' preference for the term "street railway" at that time was influenced by German emigrants to the United States  (who were more numerous than British immigrants in the industrialized Northeast), as it is the same as the German term for the mode, Straßenbahn (meaning "street railway"). A further difference arose because, while Britain abandoned all of its trams except Blackpool after World War II, eight major North American cities ( Toronto, Boston, Philadelphia, San Francisco, Pittsburgh, Newark, Cleveland, and New Orleans) continued to operate large streetcar systems. When these cities upgraded to new technology, they called it light rail to differentiate it from their existing streetcars since some continued to operate both the old and new systems. Since the 1980s, Portland, Oregon, has built all three types of system: a high-capacity light rail system in dedicated lanes and rights-of-way, a low-capacity streetcar system integrated with street traffic, and an aerial tram system. In some areas, "light rail" may also refer to any rail line with frequent low speeds or many stops in a short distance. This inherits the old definition of light railway in the UK. 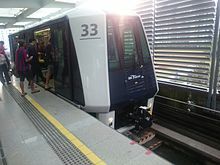 Hong Kong's Light Rail is an example of this[ citation needed], although it is also called "light rail" because it is a lower-scale system than the rest of the MTR. Sprinter in the San Diego area uses DMUs and is targeted towards a commuter rail audience; however, because of the large number of stops along the line, it is called light rail. However, low top speed is not always a differentiating characteristic between light rail and other systems. For example, the Siemens S70 LRVs used in the Houston METRORail and other North American LRT systems have a top speed of 106 kilometres per hour (66 mph) while the trains on the all-underground Montreal Metro can only reach a top speed of 72 kilometres per hour (45 mph). Los Angeles Metro light rail vehicles have higher top and average speeds than Montreal Metro or New York City Subway trains. The main difference is that Montreal Metro and New York City Subway trains carry far more passengers than any North American LRT system, and the trains have faster acceleration, making station-to-station times relatively short in their densely populated urban areas. 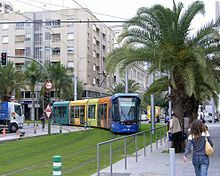 Most light rail systems serve less densely populated cities and suburbs where passenger traffic is not high, but low cost combined with high top speed may be important to compete with automobiles. Historically, the track gauge has had considerable variations, with narrow gauge common in many early systems. However, most light rail systems are now standard gauge. Older standard-gauge vehicles could not negotiate sharp turns as easily as narrow-gauge ones, but modern light rail systems achieve tighter turning radii by using articulated cars. An important advantage of standard gauge is that standard railway maintenance equipment can be used on it, rather than custom-built machinery. Using standard gauge also allows light rail vehicles to be moved around, conveniently using the same tracks as freight railways. Another factor favoring standard gauge is that accessibility laws are making low-floor trams mandatory, and there is generally insufficient space for wheelchairs to move between the wheels in a narrow-gauge layout. Furthermore, standard-gauge rolling stock can be switched between networks either temporarily or permanently and both newly built and used standard-gauge rolling stock tends to be cheaper to buy, as more companies offer such vehicles. One line of light rail (requires 25' Right of Way) has a theoretical capacity of up to 8 times more than one 12' lane of freeway (not counting buses) during peak times. Roads have ultimate capacity limits that can be determined by traffic engineering. They usually experience a chaotic breakdown in flow and a dramatic drop in speed (colloquially known as a traffic jam) if they exceed about 2,000 vehicles per hour per lane (each car roughly two seconds behind another). Since most people who drive to work or on business trips do so alone, studies show that the average car occupancy on many roads carrying commuters is only about 1.5 people per car during the high-demand rush hour periods of the day. This combination of factors limits roads carrying only automobile commuters to a maximum observed capacity of about 3,000 passengers per hour per lane. The problem can be mitigated by introducing high-occupancy vehicle ( HOV) lanes and ride-sharing programs, but in most cases the solution adopted has been to add more lanes to the roads. Most light rail systems in the United States are limited by demand rather than capacity (by and large, most American LRT systems carry fewer than 4,000 persons per hour per direction), but Boston's and San Francisco's light rail lines carry 9,600 and 13,100 passengers per hour per track during rush hour. Elsewhere in North America, the Calgary C-Train and Monterrey Metro have higher light rail ridership than Boston or San Francisco. Systems outside North America often have much higher passenger volumes. The Manila Light Rail Transit System is one of the highest capacity ones, having been upgraded in a series of expansions to handle 40,000 passengers per hour per direction, and having carried as many as 582,989 passengers in a single day on its Line 1. It achieves this volume by running four-car trains with a capacity of up to 1,350 passengers each at a frequency of up to 30 trains per hour. However, the Manila light rail system has full grade separation and as a result has many of the operating characteristics of a metro system rather than a light rail system. A capacity of 1,350 passengers per train is more similar to heavy rail than light rail. The peak passenger capacity per lane per hour depends on which types of vehicles are allowed at the roads. Typically roadways have 1,900 passenger cars per lane per hour (pcplph). If only cars are allowed, the capacity will be less and will not increase when the traffic volume increases. Compared to buses, costs can be lower due to lower labor costs per passenger mile, higher ridership (observations show that light rail attracts more ridership than a comparable bus service)[ citation needed] and faster average speed (reducing the number of vehicles needed for the same service frequency). While light rail vehicles are more expensive to buy, they have a longer useful life than buses, sometimes making for lower life-cycle costs. Light rail lines have various policies on bicycles. Some fleets restrict bicycles on trains during peak hours. 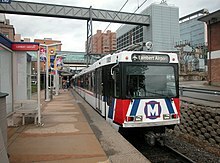 Some light rail systems, such as the St. Louis MetroLink, allow bicycles on the trains, but only in the rear sections of cars. Some light rail lines, like San Francisco's, allow only folding bicycles on board. In some systems dedicated bike parking is available at select stations and others are integrated with local bike share systems. When electric streetcars were introduced in the late 19th century, conduit current collection was one of the first ways of supplying power, but it proved to be much more expensive, complicated, and trouble-prone than overhead wires. When electric street railways became ubiquitous, conduit power was used in those cities that did not permit overhead wires. In Europe, it was used in London, Paris, Berlin, Marseille, Budapest, and Prague. In the United States, it was used in parts of New York City and Washington, D.C.  Third rail technology was investigated for use on the Gold Coast of Australia for the G:link light rail,  though power from overhead lines was ultimately utilized for that system. In the French city of Bordeaux, the tramway network is powered by a third rail in the city centre, where the tracks are not always segregated from pedestrians and cars. The third rail (actually two closely spaced rails) is placed in the middle of the track and divided into eight-metre sections, each of which is powered only while it is completely covered by a tram. This minimises the risk of a person or animal coming into contact with a live rail. In outer areas, the trams switch to conventional overhead wires. The Bordeaux power system costs about three times as much as a conventional overhead wire system, and took 24 months to achieve acceptable levels of reliability, requiring replacement of all the main cables and power supplies. Operating and maintenance costs of the innovative power system still remain high. However, despite numerous service outages, the system was a success with the public, gaining up to 190,000 passengers per day. Interurbans The term interurban mainly refers to rail cars that run through streets like ordinary streetcars (trams), but also between cities or towns, often through rural environments. In the period 1900–1930, interurbans were very common in the US, especially in the Midwest. Some of them, like the Red Devils, the J. G. Brill Bullets, and the Electroliners, were the high-speed railcars of their time, with an in-service speed of up to about 145 km/h (90 mph). 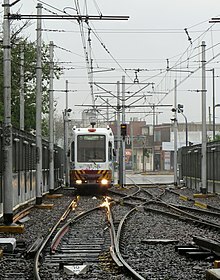 In Europe interurbans are making a comeback as " tram-trains" (locally known under different names) that operate on both railway and light rail tracks, often with different voltage. The Karlsruhe Stadtbahn is one well known example.